NEW YORK -- Be it a boerboel or basenji, a Swedish vallhund or Norwegian elkhound, all eyes in dogdom will be on Madison Square Garden this week. 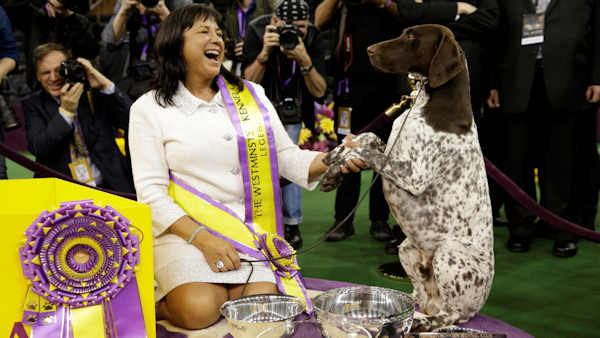 The 141st Westminster Kennel Club show is back in town, and for owners who spend well over $100,000 a year to present their prize pooches to the fans who shell out $40, buy a hot dog and shout for their favorites, it's way bigger than the Super Bowl, the World Series and March Madness. And yes, people really do fill out Bark Brackets. WHY DOES MY DOG NEVER, EVER WIN? Ask anyone who has a golden retriever or a Lab or dachshund, and it just doesn't seem fair. Because when it comes to those breeds, they wind up in the Westminster doghouse. Same for Dalmatians and Chihuahuas, complete underdogs. Some say they're too common. As in, it would be hard for any of the 65 goldens entered this year to stand out. Rather, the ribbon is more likely to go a pert wire fox terrier (14 wins) or a perfectly coifed poodle (nine wins). Preston the puli is the overwhelming pick. He's been the top show dog by far in the country over the past year, taking the AKC National Championship in December among his 95 career best in show titles. Plus he has experience on the green carpet of the Garden, faring well last February. Mop-like, his black cord coat is an eye-opener. Preston is guaranteed to get off to a good start when the show begins Monday morning. He's the only puli entered, assuring him a spot in the herding group final later that night. CJ the German shorthaired pointer won the coveted pewter bowl last year - smaller dogs often celebrate by jumping inside the trophy. As for prize money, absolutely none. Instead, the owner often stands to make a fortune in breeding rights. That's a big reason why Westminster winners usually are retired right away from the show circuit. But it doesn't always work out that way - Uno the beagle, who in 2008 became perhaps the most popular Westminster champ of all time, was sterile. Gia the greyhound won the National Dog Show that was televised on Thanksgiving Day. And there's a highly rated wire fox terrier, of course. A total of 2,798 dogs are entered in the 202 eligible breeds and varieties (this show is only for purebreds, so no goldendoodles or puggles), and the newcomers are the American hairless terrier, sloughi and pumi. In a year full of crazy endings in sports - the Patriots, the Cubs and Cavaliers, among them - no telling who will, as they say at the Garden, emerge as "the dog on the day." Besides, the biggest crowd pleaser might be someone else. Last February, a Leonberger called Dario kept gnawing at his handler's pocket while trotting around the ring, scarfing for snacks. The playful pooch didn't find any treats but found instant fame in the dog world. Dario is back this year. This is Fashion Week in New York, and from the catwalk to where the dogs walk, it's important to dress for success. Most men wear solid suits into the ring; female handlers have more choices. In general, they want all eyes on their dogs, not them. So they tend to avoid flowing outfits and shiny jewelry - to canine connoisseurs, that would be a fashion faux pas. A faux paw, too.